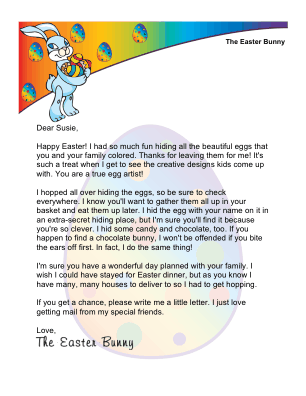 This printable letter from the Easter Bunny, to be delivered on Easter morning, lets the child know that the eggs have been hidden and the hunt is on! Happy Easter! I had so much fun hiding all the beautiful eggs that you and your family colored. Thanks for leaving them for me! It's such a treat when I get to see the creative designs kids come up with. You are a true egg artist! I hopped all over hiding the eggs, so be sure to check everywhere. I know you'll want to gather them all up in your basket and eat them up later. I hid the egg with your name on it in an extra-secret hiding place, but I'm sure you'll find it because you're so clever. I hid some candy and chocolate, too. If you happen to find a chocolate bunny, I won't be offended if you bite the ears off first. In fact, I do the same thing! I'm sure you have a wonderful day planned with your family. I wish I could have stayed for Easter dinner, but as you know I have many, many houses to deliver to so I had to get hopping. If you get a chance, please write me a little letter. I just love getting mail from my special friends.